Last year’s Hollywood block buster, Capt. Phillips, briefly introduced the general public to the very real problem that is modern day piracy. Obviously the message from Hollywood was the usual one, with easy answers found at the end of a gun, which, when you think about it, is really the heart of the Somalie pirate situation. A Hijacking takes the viewer on the tedious road that way too many people have found themselves on as a reslt of these crimes. The story is that of the cargo ship MV Rozen, that is commandeered by pirates on its way to India. While I saw much over dramatization in Capt Phillips, this film was by far, more believable, if not downright scary close to what I imagine, is the real situation faced by those involved. 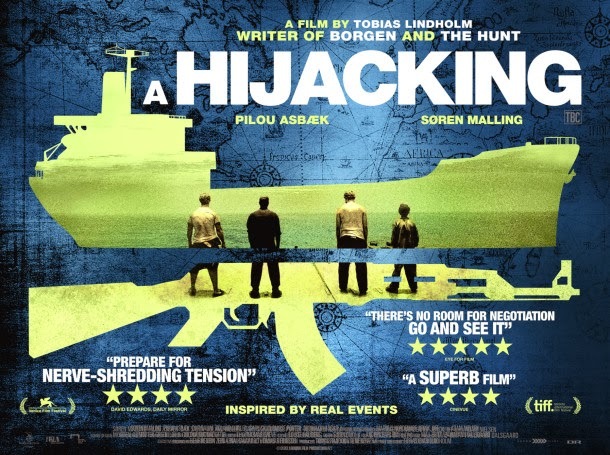 A Hijacking is not a “flashy” movie, and unlike Capt Phillips, the camera work is steady, most of the time. Although it is a powerful story, the “creative license” is limited, with the style of the film, deferring to more tangible realities. Similar to Capt Phillips, the director chooses an almost documentary tone to convey the story. The main protagonists are the ship’s Danish crew, the Chief Engineer, Captain, and the Cook. Generally the story follows the Cook, while under capture, and the various challenges dealt him. While onshore, at the Orion Seaways headquarters in Denmark, the story follows the CEO, as he negotiates with the pirates. The stresses are well conveyed and realistic. I am not sure how close, it is to a real occurrence, but this story of fiction, is definitely not recommended viewing for any spouses of sailors bound for the Indian Ocean. Both, Capt Phillips and A Hijacking, were conceived at the height of the Somali piracy crisis; the situation, in that area, has improved somewhat, but we certainly cannot let our guard down. The piracy problem remains a very serious one, in numerous areas of the world. This film does a great job at chronicling the many problems around such a traumatic event, or at least demystifying the process. I would certainly recommend it, if you can find it. The film is in Danish, with some spoken English and Arabic, so you’ll probably need the subtitles. between the CEO of the shipping company and the Somali pirates. Here’s a review and another; here is the IMDB page. ← Used but good… Almost never ! Thank you for your review. I will on this movie.